Nineteen Sixty-Eight marked a year of change across the country. Join us for our version of #fbf on October 12, 2018. 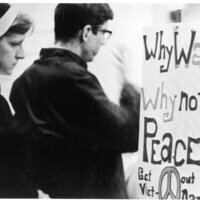 Flashback to student movements on DePaul’s campus, protests in the Lincoln Park neighborhood, and the counterculture of the 1960s. Visitors can also explore some of our unique and noteworthy treasures, including rare antiquarian books, DePaul yearbooks and memorabilia, and handwritten letters of St. Vincent. John T. Richardson Library, Room 314 2350 N. Kenmore Ave.